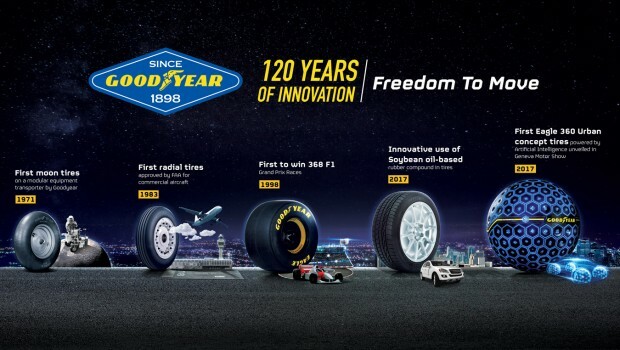 As Goodyear turns 120 years old, let’s look back at some of the company’s industry-changing breakthroughs. In 1839, Charles Goodyear discovered a revolutionary invention that changed people’s everyday lives, the vulcanization of rubber. His namesake company has claimed many firsts, including tires on the first mass-produced car of the Ford Model T (1908); first pneumatic aviation tires (1909); first tires on the moon with NASA astronauts (1971). After introducing the first aviation tires, Goodyear expanded to create fruitful and innovative products such as the first retreadable aircraft tires in 1927. By the 1980s, Goodyear launched the first FAA-approved radial tires for commercial aircraft. Throughout its history, Goodyear has been dominating across the entire spectrum of motorsports. In 1998, Goodyear won its 368th Formula 1 Grand Prix race, the most of any other tire manufacturer. For more than 60 years, Goodyear has been a fixture in NASCAR racing and is currently the exclusive tire supplier to the circuit’s top three series. To further commit to its product responsibility and sustainability promise, Goodyear established its first commercial use of a new soybean oil-based rubber compound. Goodyear’s team of resourceful scientists and engineers discovered a tread compound using soybean oil, which is naturally derived, cost-effective, carbon-neutral and renewable. By employing soybean oil in tires, Goodyear found a new approach to keep the rubber compound pliable in changing temperatures, a key performance achievement in maintaining and enhancing the vehicle’s grip on the road surface. Furthermore, this also promotes the importance of safe-driving, as the advanced tires are specifically used during dry, wet and winter conditions. To highlight Goodyear’s commitment to the community, market place, and environment, Goodyear began using silica derived from rice husk ash to enhance traction and treadwear in selected consumer tires. Rice husk ash is an environmental-friendly and cost-effective alternative to the chemical compound. Technology is becoming essential in our daily lives and Goodyear has innovated their products to meet the standards of today’s industry trends. Goodyear’s latest creation of sensor-equipped intelligent tires can continuously measure and record vital data that allows fleet operators to manage tire services. Real-time data is displayed into Goodyear’s proprietary algorithm, which enables fleet managers to monitor tire wear, temperature and pressure in real time. In 2018, Goodyear’s prototype was unveiled at the Geneva Motor Show. Intelligent tires – With the fast growth of artificial intelligence in today’s auto industry, cars are the third fastest growing device after phones and tablets. Goodyear’s focus is on securing its tires as intelligent as the vehicles, especially as consumers demand a 360-degree experience with higher levels of autonomy. Goodyear’s prototype was demonstrated at the 2018 Geneva Motor Show. Ride- and car-sharing – To ensure consumers’ rides are safe, comfortable and reliable as possible, Goodyear is focusing on improving the solutions for the ride- and car-sharing. Recently, Goodyear has worked with startup companies, such as Stratim and Tesloop in this area. Concepts for the future of mobility – The future holds a prosperous plan for Goodyear as they continue to aim to flourish towards a more urban and sustainable environment. Recent examples are revolutionary concepts, such as the Eagle 360 Urban and Oxygene, a concept that Goodyear has presented to inspire the lives of people in the future. As artificial intelligence has been progressing over the years, Goodyear’s Eagle-360 concept tire is designed to enable the future of mobility, and was officially unveiled at the 2016 Geneva Motor Show. The Eagle-360, a spherical-shaped design concept tire, was designed with key features of maneuverability, connectivity and biomimicry for autonomous mobility that allows the car to move in all directions. This contributes to the safety for passengers, as well as coping with space limitations such as tight parking lots or city streets. Goodyear’s new concepts – the spherical-shaped Eagle 360 Urban and the IntelliGrip Urban smart tire – apply emerging technologies such as artificial intelligence and vehicle-to-everything (V2X) connectivity to help the autonomous vehicles of the future navigate the millions of possible unknowns we face in every day driving scenarios.